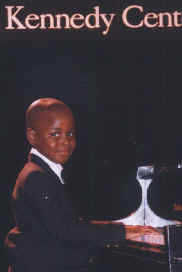 "Piano students from the Nevilla E. Ottley Music Studio, 9529 Riggs Road in Adelphi, (Maryland) performed earlier this summer on the Kennedy Center Millinnium Stage. They participated inthe Mozart Festival sponsored earlier this summer by the National Symphony. Nicole Angelique Anderson, 11, who is a 6th grader at George E. Peters SDA Elementary School in Hyattsville. 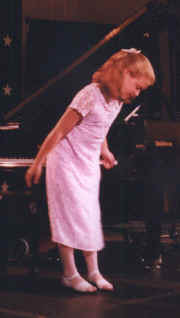 She received several awards in her category (of the National Guild of Piano Teachers auditions) in 1997 and 1998. Jodi Lyn Mills, 10, is a 5th grader at John Nevins Andrews SDA Elementary School in Takoma Park. 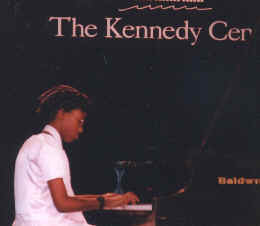 She is a 1998 National Guild of Piano Teachers gold award winner. Dominique M. Golden Graham, 6, is a 1st grader at George E. Peters SDA Elementary School in Hyattsville. He began his study of music 6 months prior to his appearance at the Kennedy Center. Shayla Roberts, 10, is a 4th grader at Rolling Terrace Elementary School in Takoma Park. She (and Dominique) won the National Guild of Piano Teacher gold pin award after having studied the piano for only two months." 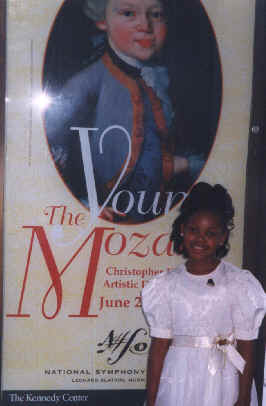 The article for this Mozart event is found in the Washington Afro-American Newspaper of August 24, 1998, "Arts Notes" section B4, written by music critic, Herbert Quarles.